One of the elements that has remained constant in the old Roller Derby (1935-1973) to the new Roller Derby (2001 to present) is family. I received a Father’s day message on Facebook from Michael J. Swassing thanking me for being the father figure for the up to 30,000 derby girls in 541 leagues in 15 countries. He stated that Derby was the only non-dysfunctional family that most of the members have. I have never met Michael, who is a successful business man in Seattle and works with the Rat City (nice name, huh?) Rollers of that area. In terms of attendance, they are the most successful Roller Girls league, drawing some 7000 fans to their last match at Key Arena. I only was able to see Roller Derby sporadically while growing up, as it was mainly in the Midwest, South and East and I lived in Portland. But when I did get to attend in Los Angeles a number of the skaters and personnel befriended and took care of me and my sister. Buddy and Bobbie Atkinson said they changed my diapers, but I wasn’t that young. And all of the people associated with the Derby were so close with each other as they lived together and traveled together. There was big Sid Cohen from Chicago, a 6 foot four 250 pounder who had originally been with the Mob in Chicago and had been sent in to the Coliseum in Chicago to plant a bomb because my Dad wouldn’t work with the mob. He became a close friend of my Dad and worked with him for years before going to work with the Ice Follies (see, Al Capone could have had a whole different life). I have a wonderful photo of Sid and me at a beach (Santa Monica? ); I was about five, skinny, worried looking and Sid in a shirt and tie walking along side me carrying my little bucket and shovel…I loved Sid and all the others with Derby. As I became an adult and the official head of the Derby (1958-1959), my own family developed around me. First there was Peggy Ahern, who was a “leftover” from the previous regime. Peggy had been married to a skater and then referee and had become a discount ticket exchanger. 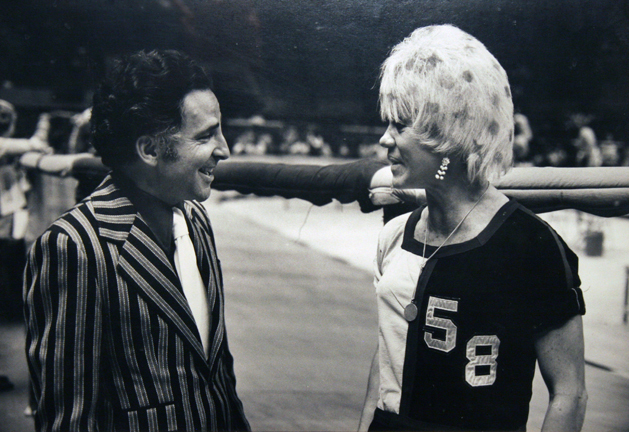 The way Roller Derby was promoted before television was distributing hundreds of thousands of discount tickets in the various cities, usually sponsored by some local market, brewery, etc. They would offer 50 cents to $1 off the price of the tickets and had to be exchanged at the venue. It was not unusual for the ticket statements for the games to show up to 95% discount tickets. One of the first things I did when I took over Roller Derby was to reduce the price of all tickets by 50 cents (to $1, $2, and $3) and declare all discounts void. I knew that television would bring the fans, and the unit managers would no longer be able to pocket the revenue from the tickets that had put in for discounts every night. So Peggy became my box office manager, and it was a run that lasted until the 80’s with BASS Tickets. We learned together. Peggy had a huge Cadillac (I forget why) and her car trunk became our traveling box office. Remember, no computers, no outlets, etc. We did take phone reservations for the games, but credit cards were not used so people had to pick up their tickets at the box office the nights of the games. Hal Janowitz was a great skater who when he gave up skating ran the various box offices for us at the games, and when we went on the road later he was the road manager and settled the box offices for us and tried to keep the skaters in line (lots of luck, Hal). Sunnie Senne was a fan who came to the games at Richmond, and one night when we were short of people to help Peggy, I announced at the game did anyone want to work for the Bay Bombers and Sunnie, who was certainly a character, came down and stayed with us for years. Eventually all of Peggy’s daughters, Lorraine, Maggie, and Denise worked for us in some capacity. Harold Silen, the attorney who incorporated the company (Bay Promotions, Inc) for me, became my friend and partner over the next 50 years. Hal represented many of the North Beach clubs and also Willie McCovey and Willie Mays of the Giants. Of all of us, he was the class act. When I started the one nighters around Northern California (Sunday night at Kezar Pavilion in SF where we would televise and videotape for elsewhere in the country), we had pretty well set up our ticket sales. We had our reservation numbers on our penalty boxes and made sure the cameras hit them. On Mondays we skated in San Jose, one mid week date either a Stockton, Santa Rosa, Sacramento or other, Friday at the Richmond Auditorium, and Saturday at the Oakland Auditorium. Of course, the schedule would vary depending on the date availability. We sold dates to fairs, organizations, etc. And one to the Navy. We skated on the hangar deck (the first deck below) on the USS Ranger, and the crew enjoyed it immensely, and I even got to go out on the carrier later on a training cruise. We even donated a game and skated at San Quentin. We sold one date to the 20-30 club in Vallejo (I think you could join at 20 but could stay in this civic organization no later then 30), and the young man was the head of it became enamored of Peggy. He insisted on helping her with everything she was doing and showed up at a number of games afterwards. Peggy is quite statuesque and I know that she had a number of her own fans. Peggy and Sunnie took the phone reservations (her favorite call: ” is this where you pick your seats on the phone?”), and had help from George “Run Run” Jones’ wife who sometimes work in the box office. George went on the become the white haired guy who ran on the field with the towels and liquids for the Oakland Raiders and wore all of Super Bowl rings. He died recently. Now that brings us to Jo Downs. Jo had worked for my father back east and was a wonderful bookkeeper….her only problem, she drank at night. Peggy had to pick her up each morning as she didn’t drive and Peggy never knew what she would find. Jo helped me with scheduling and terrified everyone with her demeanor….she was a great buffer for me. Ticket sales were really bizarre…..they were only on the day of the game and by phone. Hal Janowitz would get to San Jose or wherever the day of the game at 10 am and sell the tickets until game time when we would add 1 or two additional personnel, depending on our crowd expectations. 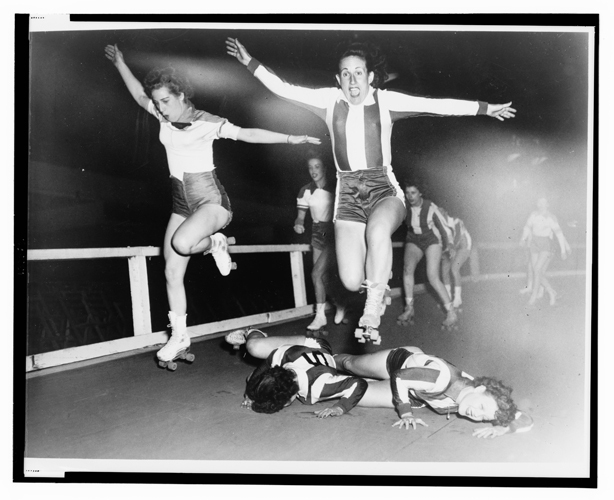 The Roller Derby games were 8 periods, 4 each half with the women and men alternation. In the fourth period we would announce that tickets were on sale for the next game and people would flock to the box office and and stand in line for the entire fourth period and sometimes miss the start of the second half. I think Peggy suggested that since standing in line for tickets is what people wanted to do, why didn’t we just cancel the games and just sell tickets. Sounded like a great idea to me. We all did so many things together because Roller Derby was all of our lives. There was the expected separation between the skaters and the front office, but we were a very small organization and even when the entire International Roller Derby League was touring the country (and Canada) in major arenas from Madison Square Garden to Maple Leaf Gardens, and the Oakland Coliseum Arena to the Mobile Auditorium, it all came from our small group with additions for shipping our tapes and writing and sending out our advance press releases and advertising to all the cities we were playing. I supervised all of that. In addition, we would schedule an hour weekly at KTVU channel 2 in Oakland and Walt Harris would cut 1 minute and 30 second spots for distribution to the television stations in the cities we would be playing. We could ofter cut up to 45 (!) spots in an hour, using an endless loop of skating with info copy on the screen. I guess it worked. Hal and I and Peggy went on to start BASS tickets, northern California’s computerized ticket agency. And when we joined with the Ticketmaster cities everyone wanted to know how BASS operated, and Peggy explained how to run a ticket company to most of them. And I used my guerilla marketing from Roller Derby to help make Ticketmaster the dominant force in the industry. Both Jo Downs and Sunnie have passed away; Peggy and her daughter Lorraine live here in Sonoma, Hal Silen and I are still involved in projects, and Hal Janowitz is enjoying life in Alameda, California. When I see him, I ask him if he is ready to go out on the road again. Amazing, as usual. Thank you and Happy Fathers Day. I am enjoying these roller derby tales, Jerry! Keep it up. Hope that these stories never get lost,Your life in Derby is also history,as your grew up with many great skaters. Im sure that there is many more stories to be told. Thank you for your stories. This one reminds me of the days when my trunk was full of Derby tickets and old smelly uniforms that needed to be washed. Being a Roller Derby kid meant that you always had multiple adults around who looked after you and made you safe no matter what was going on in the outside world. I hope todays kids find the same sense of safety and belonging that I grew up with. It gave me a confidence, a sense of morality and code of behavior that has served me well throughout my life. Thanks for the memories!